Does Procrastination Stop You From Being Successful? You can use any of the 365 motivational quote of the day to prevent procrastination delaying your success in life and career! Are you a procrastinator? Do you spend all day finding little things to do that stop you from doing what you really should be doing? Do you put off doing the important jobs? Do you waste time and before you know it the day has gone and you haven’t achieved anything? Unfortunately, procrastinating is one big problem that prevents many people from being successful. There is always an excuse for procrastinating but deep down you know that you need to stop doing it. Deep down you know that you spent way too much time sitting out in the sun while you should have been inside working. There are just too many tasks to do so is it really that bad to put them off until tomorrow? The problem is that tomorrow never comes and those tasks will often never get done. Procrastination can become a habit if you’re not careful and before you know it you spend every day procrastinating and getting nothing done. There is always something else to do that is more exciting or much easier, so why not put off the harder tasks and do the easy ones instead. Often that is all it is – making excuses to put off doing what you know needs to be done. Is it really necessary to check your emails 30 times a day? Is it really necessary to harvest your crops in Farmville every day? Little things like checking emails and playing online games, are just procrastinating and they are stopping you from being successful. I’m not saying that there is never any reason good enough for a job not to get done. There will be times when something urgent comes up that you must do and as a result other tasks are not completed. These things will happen from time to time and that is fine. The problem occurs when it is not important things that are stopping you from getting your work done, but little unnecessary things. This is the difference between a legitimate delay and an excuse to delay. Sometimes we procrastinate because we are a little unsure of what direction we should be going in. If we are not sure of the task at hand then we put off doing it. It helps to be organized and sit and plan your schedule so you know exactly what needs to be done. 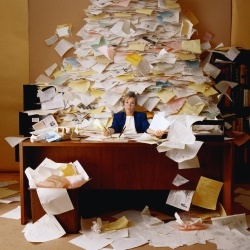 Being organized is a big and effective tool that will help you to stop procrastinating. It can also be useful if you set yourself a reward for when the tasks for the day are all completed. Perhaps once you have completed a task you can spend half an hour playing Farmville, and make sure that you don’t go and play it until that task is complete. It doesn’t have to be a complete goal reached before receiving a reward; you can give yourself small rewards along the way when you complete steps. Some tasks or projects are too big and take too long to wait until the end for a reward and then you will lose motivation and start procrastinating. It is best to split your project up into smaller steps or goals along the way and when you complete one step then you receive a reward. Make the decision to complete a project and have some clear set instructions or steps of how you will do it. If you are indecisive of what you are going to do then this will just delay doing it. Have clear goals so that you know what you are working toward. The biggest reward that you will receive is the satisfaction you feel once your final goal is reached. You will be victorious over procrastination and you will be proud and satisfied that the job is done and you are successful. Stop procrastinating right now and start doing. Stop putting it off until tomorrow, stop making excuses, find some motivation and start working toward reaching your goals. "People are always blaming circumstances for what they are. I don't believe in circumstances. "If you envy successful people, you create a negative force field of attraction that repels you from ever doing the things that you need to do to be successful. "Look at a day when you are supremely satisfied at the end. It's not a day when you lounge around doing nothing.